Yeah, but: We are tied down to a language which makes up in obscurity what it lacks in style. The Long Version: First, to be clear: it's not the saints that I have a problem with. I once lived in the northern Toronto 'community' of Willowdale, and anyone who's ever driven through there knows that it has the highest density of stupid street names in the city. Some of the gems include Moonstone Byway, Purple Sageway, Thimble Berryway, and Water Wheelway - all private roads in condominium townhouse developments. I used to live at 1 Burnt Meadoway, and to get there you'd turn onto Song Meadoway from Freshmeadow Drive. If you hit Hollyberry Trail, you've gone too far. It was so difficult to get a pizza delivered that I only lived there for about six months. So I'll take any sort of 'people' street name without minding its origins, be they religious, historical, or contemporary. History and culture adds to the texture of a place, which I love. 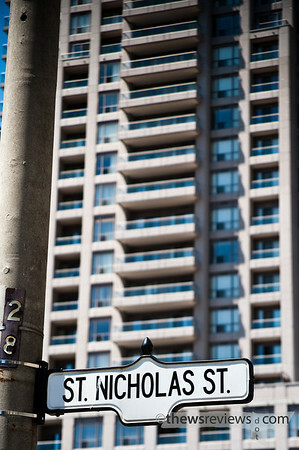 Really, there's nothing special about living at the intersection of Mentor and Mogul - yes, it's in Willowdale - but in Toronto's downtown even a generic street name like John is an historical reference. No, my complaint is tied to Tom Stoppard's observation about the qualities of the English language and how it's applied. In a nutshell: who thought it would be a good idea to use the same abbreviation - ST. - where it has two different meanings? It's bad enough that English lacks style, this borders on intentionally obscure. 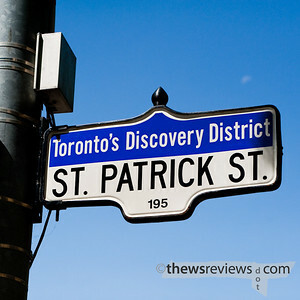 It absolutely wasn't an international city when these streets were named, but it is now: most of Toronto's residents today were born outside of Canada. 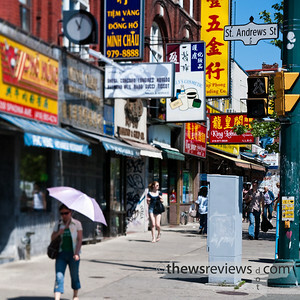 The tourist trade is also a major factor in the economics of the city, with 'vistors from overseas' spending $1.09 billion dollars here in 2008. 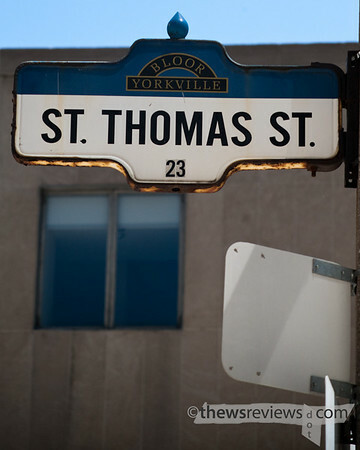 Having Street and Saint abbreviated the same way on the same sign is a quirk of the language that's not even noticed by native English speakers, but it's a needless barrier to those who are less familiar with the language and the city. There's no excuse for making life more difficult for people who are here from somewhere else. And while I'm on the subject, there's also no consistency to how the signs are punctuated. The ST for Saint invariably gets a period after it, which is traditional even though contractions usually aren't punctuated. I suppose the ST for Street could be either an abbreviation - the first two letters of the word - or a contraction - first and last letters - and its ambiguity is reflected in the fact that sometimes it has a period following it, and other times it doesn't. 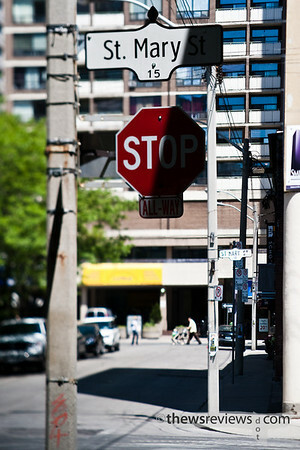 Signs on different sides of the same street may not be written the same way. Details matter: if I had to navigate by the languages that I can't read, I'd be trying to match the shapes of the characters that I see on a map or in a photograph. Being inconsistent isn't fair. When I was a kid, my teacher awed the class by telling us how many words the Inuit have for snow. I remember it being 22, but it hardly matters since it's basically an urban myth inspired by a lack of both linguistic and cultural awareness. But it's still an appealing idea: that someone else can be in some faraway place where they see more distinction and have better insight than we do. Well, I've lived in the city all my life, and even I can tell the difference in snow depending on the temperature (wet, dry, heavy, light), traffic (packed, ice, slush) and recent weather conditions (drifts, crusted). But try as I might, I can't see that many different types of road. We English-speakers have a lot of different words for the strips of land that we dedicate to cars. Street, road, avenue, drive, boulevard; highway, freeway, expressway, parkway; interstate, turnpike; crescent, circle, grove, gate, lane, and court. But there are a lot more to choose from. 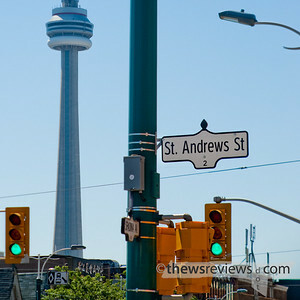 Alley, Beach, Bend, and Bypass are all recognized by both the Canadian and American postal services; Canada adds Abbey and Byway, the USPS likes Branch, Bridge, Brook and Berg. Needless to say, the list doesn't stop at "B". I'm not going to try to count all of the different abbreviations that Canada Post and the USPS recognize for street types. I gave up when I hit 100 on the American list, and I was only about half-way down the page. The Canadian list is even more difficult, since it - like the Inuit and their words for snow - includes more than one language. I'd guess that there are at least 300 'official' words for street. Twenty-one of them are common enough that they're listed at the start of my Perly's map book. There's no common trait that defines what designator a street gets. There are broad categories: 'Highway' is going to be a limited-access road, and 'Crescent' is probably going to be something quiet and residential. But nobody can stand on a particular patch of pavement and determine from its inherent characteristics if it's a road, boulevard, avenue, or street. There's no impartial standard that determines whether an it should be called Bob Loblaw Road or Bob Loblaw Avenue. Odonyms matter, but we need to remember that they're arbitrary. Alliteration is great, and Saint Something Street has a nice rhythm. 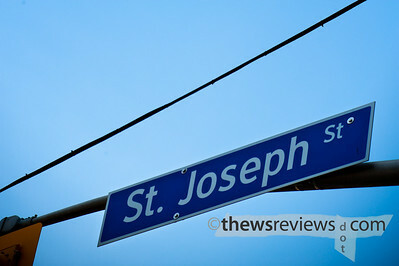 But street names aren't the place for style, and there's no excuse for obscurity.